Ever say to yourself, what could make this outfit better? This season that blank will constantly be filled in for you. The fashion tide is crashing hard into a sea of opulence and if you happen to get splashed it’s going to be, in a word- spectacular. As spring ’17 takes shape you’ll notice when it comes to your accessories the more eye-catching the piece, the more you have to have it. Here’s a short list of styles that will add to your look and your personality. While the effort has been traveling from the neck to the ear for a while now when it comes to statement jewelry, this season it is the MUST have item! With so many styles to choose from, we’re talking sassy tassels, holographic hoops, a bevy of balls and even mix and matched styles there is no shortage of options when it comes to adding some life to your lobes. Rock these can’t miss styles with all or some of your hair away from your face to really let them have their moment. As I am sure you know by now, fashion is cyclical. Last spring’s new trend could ultimately be this spring’s hottest trend. It usually takes almost 3 years for a trend to really hit its peak … I mean, chokers? Am I right? Back for a third season and still going strong. Well, such is the case with the platform brogue sneaker. It hit the runways in 2015 and 2016 and returned guns blazing in spring ’17 with a fresh twist thanks to designers like Alexander Wang and Stella McCartney. As you can imagine with comfortable footwear, fashion heads are infusing these into their off-duty style at warp speed. Dress them up with trousers or pair them with your trusted skinnies for an immediate infusion of freshness. Putting a ring on it looks better with out the hefty venue deposits, okay! Straps are taking a back seat for those who need their accessories to have accessories. The ring handle is hot like fire thanks to designer line, Chloé for having one of the hautest hoop bags out. This “it bag” inspired everyone on the fashion scene from Chanel to Simon Miller all the way through to Target getting in on this modern detailed action. Outfits that have “some” going on but not a ton- think minimal embellishments, will let this cool handbag style have it’s moment while also adding to the ensemble. Sure there will always be a place for your classic aviators but as you saw last summer with it’s mirrored mixed metals and double bar silhouettes, style bravery speaks louder than words and reflects perfectly in beach photos! Colored mirrored lenses and glasses that are equally fun and funky are stealing the spotlight. Dolce & Gabbana, Fendi and Elie Saab lead the pack with oversized and over-the-top designs. Designed to be seen, pair sunglasses like these with anything from a maxi dress that needs a cool pop of excitement all the way to your your favorite summer shorts and a bodysuit. And clearly- they’re just begging for a beach moment. Don’t for get them on your next shore stint. Get more deets on these sunnies in the next post! If you thought the trim aisle at AC Moore is beginning to resemble your summer-style shopping cart, you might be on to something. From pom-poms, to fierce fringes and pinches of colorful ric rac, the playful factor of this season’s embellishments are next level. Seen on the runways at Moschino, Desigual and Dolce and Gabbana there is no denying the fun feels these pieces have. Wear it on your bag to make an LBD spring friendly or rock it on your shoes for some festive feet, this irresistible and energetic design style is sure to make the wearer and all who see it happy. Hopefully you find this list of accessory upgrades useful as you develop your spring/summer arsenal. 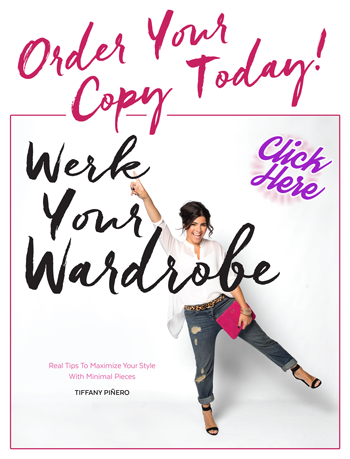 As always- if you want to enlighten myself and the style community with your outfits or your takes on these trends, share here: @TiffanyPineroStyle on instagram |@TPineroStyleon Twitter |\TiffanyPineroStyle on Facebook!